The Supreme Council of the Eurasian Economic Union (EAEU) has approved the decision to grant Moldova an observer status, Kyrgyz President Almazbek Atambayev said Friday. Russian President Vladimir Putin has arrived in the capital of Kyrgyzstan, Bishkek, to take part in the meeting of the heads of state of the Collective Security Treaty Organization (CSTO) members, as well as a summit of the Supreme Eurasian Economic Council of the Eurasian Economic Union (EAEU). 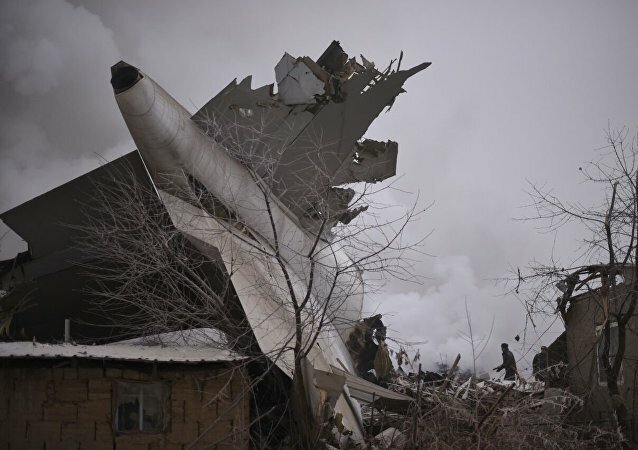 The number of people killed as a result of the mid-January crash of a Turkish cargo aircraft into homes near Kyrgyzstan’s capital has exceeded 40, the Interstate Aviation Committee (IAC) said Thursday. Kyrgyz parliamentary opposition demanded on Thursday during a parliament session to create a commission of lawmakers to investigate the circumstances of the crash of a Turkish cargo aircraft near the Kyrgyz capital of Bishkek, a RIA Novosti correspondent reported. Experts of the Interstate Aviation Committee (IAC) started to inspect the crash site of a Turkish cargo aircraft near Bishkek, Kyrgyzstan’s Emergencies Ministry spokesperson told RIA Novosti on Wednesday. ICAO has offered condolences for Monday’s deadly plane crash in Bishkek, ICAO Council President Olumuyiwa Benard Aliu and Secretary General Fang Liu said in a statement on Tuesday. The second black box has been discovered at the site of the crash of a Turkish cargo aircraft near Bishkek, the Kyrgyz government said Tuesday. The body of the fourth crew member of a Turkish cargo plane that crashed near the Kyrgyz capital of Bishkek has been discovered at the crash site, a representative of the country’s Emergencies Ministry told RIA Novosti Tuesday. 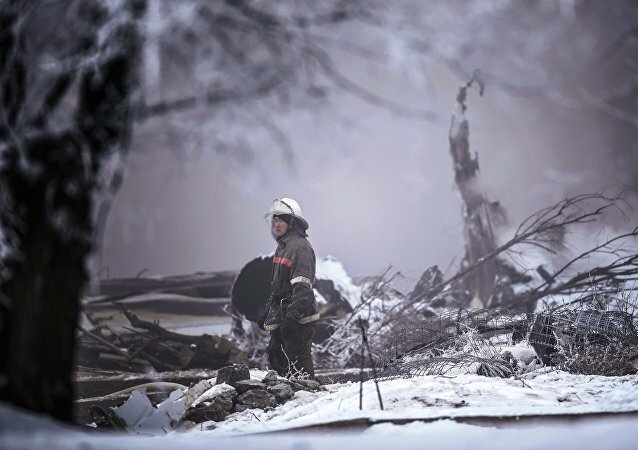 Kyrgyzstan’s forensic experts have identified 37 bodies pulled from debris of a Turkish cargo plane that crashed into homes near the nation’s capital, First Deputy Prime Minister Muhammetkaliy Abulgaziev said Tuesday. 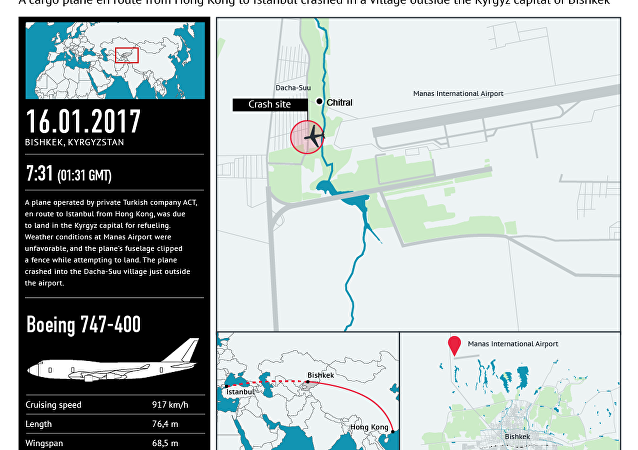 The Boeing 747, operated by ACT Airlines, crashed into homes near Manas airport close to the Kyrgyz capital, Bishkek, where it was supposed to make a stopover. 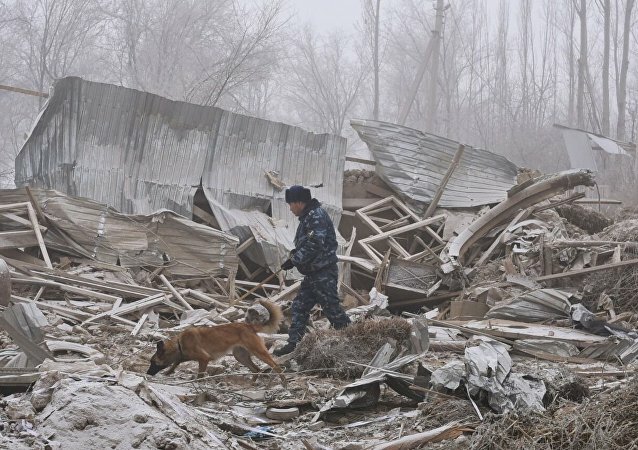 The Kyrgyz authorities said up to 37 people had died. 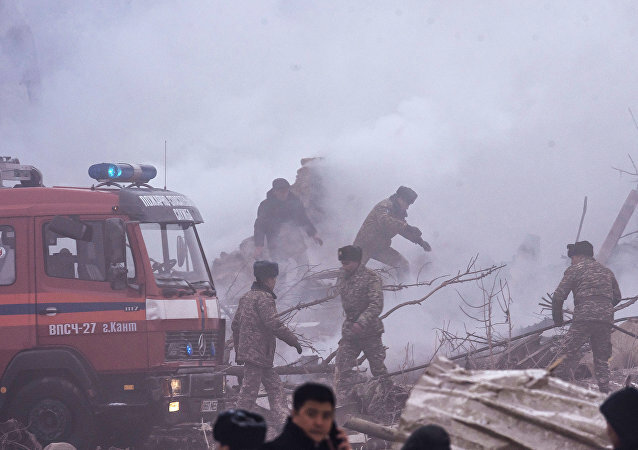 The Kyrgyz president ordered a thorough probe into the tragedy, which has been reportedly blamed on dense fog. A Turkish cargo plane crashed damaging homes near Manas airport close to the Kyrgyz capital Bishkek, where it was supposed to make a stopover. One family was inside their home when the plane crashed right outside their window, destroying their roof. Sputnik Kyrgyzstan spoke to the victim in an interview. The Kyrgyz vice-president confirmed earlier media reports that a black box of a Turkish cargo plane that had crashed earlier in the day was found. A Turkish cargo jet, operated by ACT Airlines, crashed while en route from Hong Kong to Istanbul Monday into homes near Manas airport close to the Kyrgyz capital, Bishkek, where it was supposed to make a stopover. A flight recorder of a Boeing cargo aircraft that crashed near Bishkek has been discovered, a source in the Kyrgyz government said Monday. Russian President expressed his condolences to his Kyrgyzstan counterpart amid deadly plane crash near Bishkek, the Kremlin said Monday. Kyrgyzstan’s transport prosecutors launched a criminal investigation on Monday amid Turkish cargo jet crash leaving dozens of people dead. 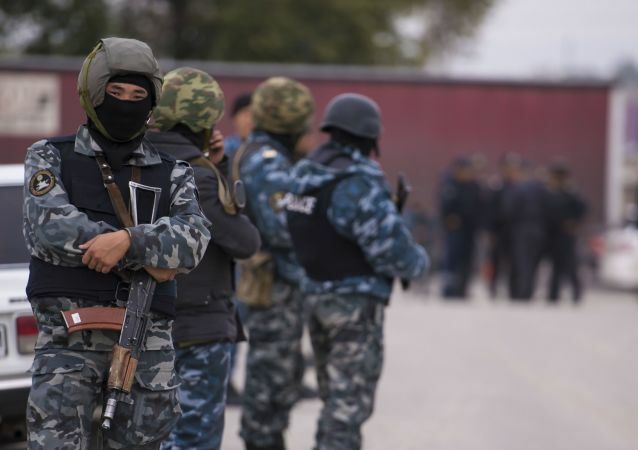 Up to 31 bodies and nine body parts have been uncovered at the crash site of a cargo flight in Kyrgyzstan, the Kyrgyz presidential press service said Monday. The death toll from the crash of a Turkish Airlines cargo jet near Kyrgyzstan’s capital of Bishkek has reached 37 people. 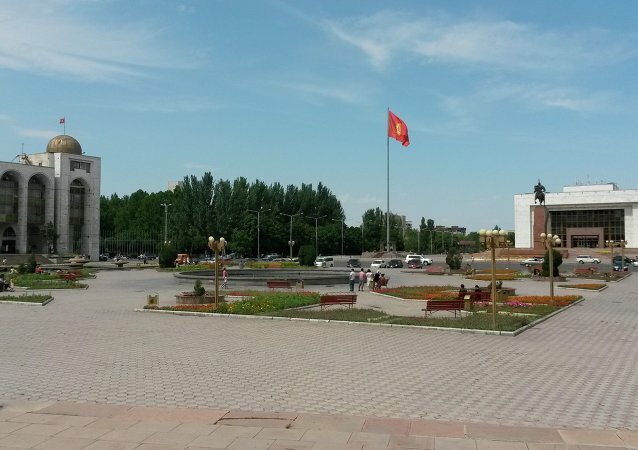 Two improvised explosive devices in the center of Bishkek was neutralized by the Kyrgyz National Security forces.